In the late 1700s, as the events of the French Revolution roiled France, London displaced Paris as the primary hub of international art sales. Within a few decades, a robust and sophisticated art market flourished in London. 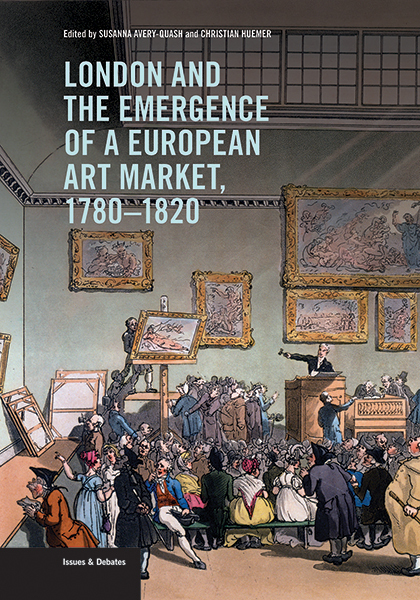 'London and the Emergence of a European Art Market, 1780-1820' explores the commercial milieu of art sales and collecting at this turning point. In this collection of essays, twenty-one scholars employ methods ranging from traditional art historical and provenance studies to statistical and economic analysis; they provide overviews, case studies and empirical reevaluations of artists, collectors, patrons, agents and dealers, institutions, sales and practices. Drawing from pioneering digital resources-notably the Getty Provenance Index-as well as archival materials, such as trade directories, correspondence, stock books and inventories, auction catalogs and exhibition reviews, these scholars identify broad trends, reevaluate previous misunderstandings and consider overlooked commercial contexts to illuminate artistic taste. From individual case studies to econometric overviews, this volume is groundbreaking for its diverse methodological range that illuminates artistic taste and flourishing art commerce at the turn of the nineteenth century. Susanna Avery-Quash is senior research curator in the history of collecting at the National Gallery, London, where she is in charge of the research area of buying, collecting and display. She has led research projects, organised conferences and published extensively on the history of collecting and the art market.|Christian Huemer is director of the Belvedere Research Center, Vienna. From 2008 to 2017 he headed the Project for the Study of Collecting and Provenance at the Getty Research Institute.